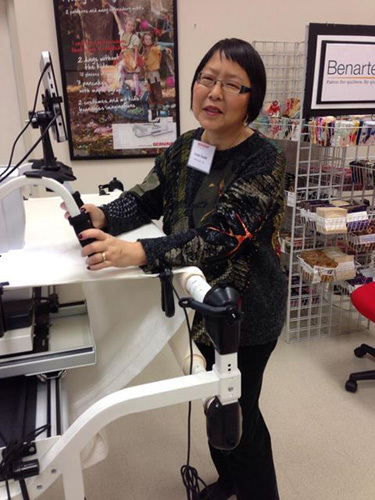 I’ve been a member of the BERNINA Artisan Ambassadors group for over a decade. It has been such a thrill and an honor to have been invited to be a part of this prestigious group of sewing and quilting teachers and industry insiders! This month we had our first reunion in six or seven years so we were particularly excited to get together and see our friends and the BERNINA staff! I consider myself an advanced quilter but what I need to work on is my free-motion quilting skills. It is difficult for me to move the fabric under the machine and do “quality” quilting, but I found that the BSR [BERNINA Stitch Regulator] works wonders. John Flynn calls it “training wheels” for quilters and that is a great description. One year at a quilting convention, I took a class on one of the giant silver industrial long-arm machines. Even though it moved smoothly on the carriage, my free-motion quilting was a disaster. I couldn’t make small circles and certainly couldn’t trace over the same stitching lines. It was too big and clumsy and not for me. Besides that, it would take up too much space in my studio. 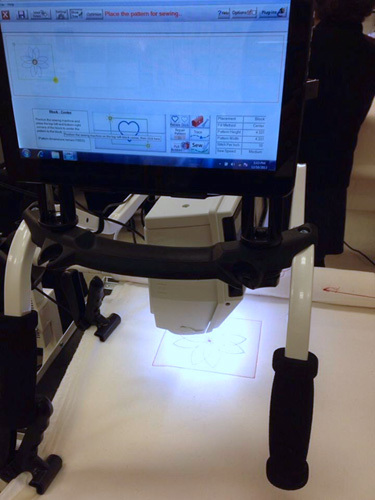 So, I was excited to hear that BERNINA has a long-arm rail system for my BERNINA 830 sewing machine that connects to a small tablet! So easy! April, the BERNINA expert, showed us how to use the pre-programmed designs to automatically stitch on our quilt, and I know I could easily teach myself the other features! It was that intuitive and successful! So much fun and a beautiful stitch. The QuiltMotion software program was nice and easy and the rail system moved so smoothly. I’m sure that this would make my free-motion stitching look a lot better, and the ten-foot-long frame would easily fit in my sewing area! But shhhhh… I hear that a 20″ sit-down quilting machine and a 24” long-arm are in the works now in Switzerland… so I think I will wait for their unveiling! Previous Previous post: WeAllSew Celbrates Our Loyal Fans: 69,000 Fans!